City of Fort Wright, Kentucky > How do I? For a missed pickup, you can contact Rumpke directly by calling 859-472-7339 and selecting their residential line. The Homestead Exemption (HEX)/ Disability Exemption (DEX) is determined every two years by the General Assembly to reflect increases in the cost of living. The current exemption (assessment reduction) is $36,900. For additional information, please visit Kenton County PVA at www.kentonpva.com or call 859-392-1750. Contact the Kenton County Occupational Licensing Office at (859) 392-1440 or click here. Directions to all City facilities can be obtained by contacting Administration at (859) 331-1700. M-F 8:00 a.m. – 5:00 p.m. Submit an open records request to the City of Fort Wright, City Clerk, 409 Kyles Lane, Fort Wright, KY 41011. Yard/Garage sale permits are required and can be obtained at the City Building, M-F 8:00 a.m. – 5:00 p.m. Contact the City Building at (859) 331-1700 who will determine the responsible utility/party and report the problem. You can check the City’s Five Year Road Plan online by clicking here. If you have additional questions contact the City Building at (859) 331-1700. Contact the City Building at (859) 331-1700 who will determine the responsible party. Visit Buy Crash.com. 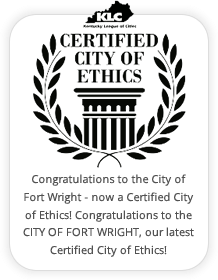 This website allows you to download reports or you can call or stop by the Fort Wright City Building. We are located at 409 Kyles Lane. You can normally obtain records Monday through Friday from 8:00 a.m. until 5:00 p.m. Please note there is a $10 fee for all accident reports. Fines may be paid in person or by mail at the City of Fort Wright, 409 Kyles Lane, Fort Wright, KY 41011. M-F 8:00 a.m. to 5:00 p.m. Phone (859) 331-1700. The Police Department offers fingerprint services for a $25 fee on, Wednesdays from 10:am – 4:30:pm. Please call 331-1700 to set up an appointment. The Fort Wright Police Department does not provide Background Checks. The Kentucky State Police Records Branch, Name Search Section, conducts background checks for employment, licensing, and other similar purposes, as authorized by the Kentucky Revised Statutes. To obtain information on how to conduct a background check, and to receive Background Check Release Authorization Forms, please contact the Kentucky State Police Name Search Section at 502-227-8700. Business hours are M-F 8-4:30 EST. How do I rent the South Hills Civic Club? View Civic Club information by clicking here. See the Kentucky Online Voter Registration portal for more information on registering to vote or to update your current registration.